*Firstly, the beyond incredible Brandy will play her first UK show in four years on Tuesday 24th September with a one-off live date in London at IndigO2.The show is in support of Brandy’s recent slow-burning yet magnificent album ‘Two Eleven’. Tickets go on general sale at 9am from Friday 16th August. 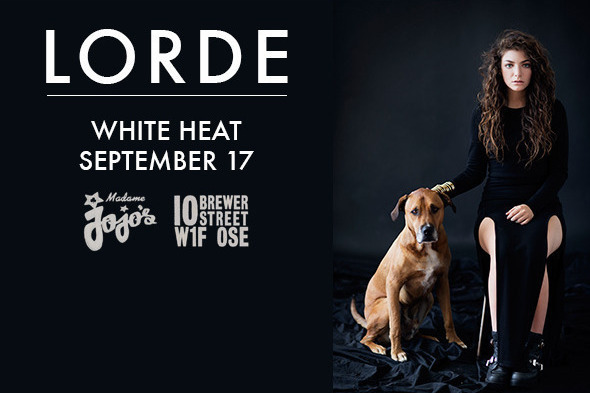 *Rising star from New Zealand, Lorde has announced details of her debut UK performance with a one-off show at Madame JoJo’s on Tuesday 17th September. Tickets for the show purchased here. Following that, Virgin Records will service the singers debut collection, ‘Pure Heroine’, which will be available on 28th October, preceded by the single ‘Royals’ which is expected on 20th October. *Bright Light Bright Light continues to impress and excel at crafting seemingly personal yet universal tales within the lyrical content to his songs. This time, by way of thanks to the 40,000 scuscbriers to his SoundCloud page, Rod has shared an unreleased, leftover track recorded during sessions for his outstanding debut, ‘Make Me Believe In Hope‘. Produced in collaboration with the masterful Andy Chatterley, ‘Inside Out’ has a wondrously spiky, electro synth backdrop and offers a changed sound due to the different reference points away from Rod’s love of nineties pop, which ultimately makes for a compelling listen. *One of our favourite new and emerging popstars BANKS has unveiled a new release titled ‘Waiting Game’, which presents another shade to her already impressive repertoire. Stylistically, it is richly dark and intense, the fragile beginnings, pulsating baseline and celestial, hymnal quality to the vocal adds to the collective drama of the piece. The way in which the track rises to giddy heights and falls to the quietest lows is captivating and engulfing. Absolutely stunning. *Previews of tracks to be included on the forthcoming Naughty Boy album ‘Hotel Cabana’ are now online. Most excitingly, there is his collaboration with the mighty and supreme Gabrielle, on the song titled ‘Hollywood’. The track is fuelled by stirring, orchestral strings but it is those distinct and undeniable vocals that elevates and propels the song. Another sample, which features verse two can be heard at iTunes here. *Foxes has assimilated a nice side project of late as a featured artist after appearing on tracks by the likes of Zedd, Fall Out Boy and Rudimental. Let’s not forget that she is a popstar in her own right, a new video has been released to accompany ‘Youth’ which is being re-releaased as a single on 6th October.